We tested the Blacks Kilimanjaro Leather Walking Boots on a day during which rain was intermittent, on relatively flat terrain with lots of long wet grass and mud. The good-looking, neat boots were easy to put on and were immediately comfortable. My feet were kept dry and comfortable throughout - the Sympatex lining was certainly effective in managing perspiration and keeping the rain out. Our only slight quibble here is that there is no gusset between boot tongue and the side of the boot leaving scope for rain leakage. However, to be fair, this wasn't a problem on our test but may have become so in more torrential rain. Although they have a relatively low profile, the Vibram rubber soles provided good traction and protected feet over reasonably rough ground and held well in mud. My heels were held comfortably in place which will certainly have helped in preventing blisters. The protection around the toe is also good. The ankle support is quite good but the low cut of the boot means that inevitably this is limited. The upper and sole are not particularly stiff so there is generally a good level of flexibility in the boot. 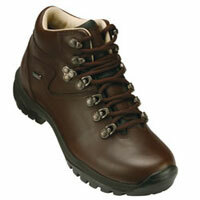 The light weight and padding mean that Blacks Kilimanjaro Leather Walking Boots are immediately very comfortable. As well, there's enough shock absorption and grip in the sole to take you over uneven paths with lose stones or gravel such as those encountered typically in lower level hill-walking. We would not expect that you'd use this boot for high mountain, rocky and/or steep routes.